“The first pastor I make was when I was 16 years old. I was so excited. It was something I wanted to do because in Mexico, this type of food is so famous. All over Mexico City, you see the pastor. Every corner,” Justino Jimenez says. Then, standing in his kitchen, he takes me back to his first childhood encounter with al pastor, his eyes glowing with that self-same awe as he seemed to relive the moment. Justino Jimenez doing it right. by Jacki Philleo. I first encountered his al pastor about a year ago when I was invited over to his house by mutual friend, Benjamin Miller (of South Philly Barbacoa). For his wife’s birthday, Jimenez was cutting tacos off a spit standing in front of its heating element [the horno, which was inherited from Lebanese immigrants in Mexico; he cooked his Thanksgiving turkey on it last year] on the kitchen counter. A hose ran down to a propane tank that was helping turn perfectly marinated pork into buttery gold. “It’s a different flavor when you cook on the spit and when you cook on the plancha [grill top]. Even when it’s the same cut and the same preparation, it’s going to taste way different,” he says. “The plancha can make the meat a little bit dry. When you cook on the spit he says you get a fuller result and flavor. You get that crispiness but it’s still juicy on the inside, as the juices drip from top to bottom. “There’s also the added benefit of the pineapple, which catches some heat as it sits just above the heating element, dripping juice upon the pork. 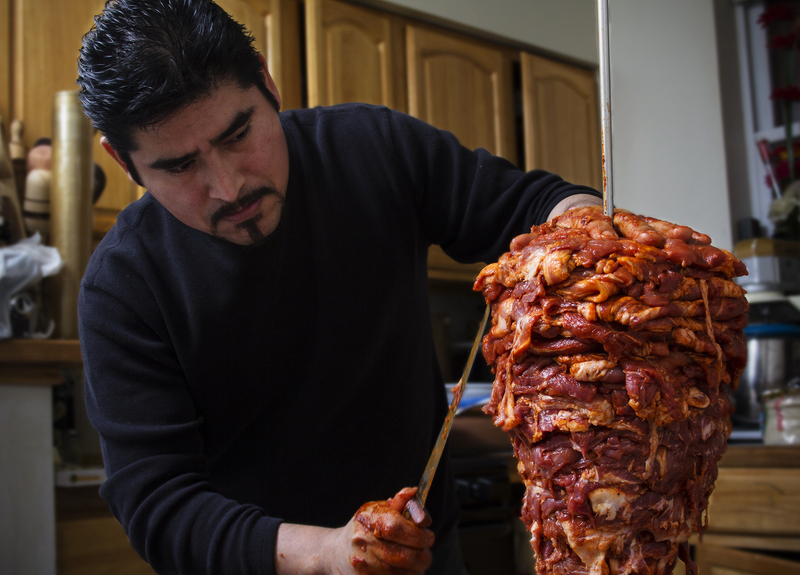 While he’s been making al pastor for so long, he’s not using a recipe that’s been handed down through generations. Rather, it’s informed by his experiences in kitchens in Mexico and in Philly. “I like to try new recipes. I like to try new sauces,” he says of his general approach to cooking. Originally from Puebla, he moved to Mexico City at 15 where he started working at the taco shop where he eventually made his first pastor. His cooking background was expanded upon his arrival in Philadelphia at age 23, when he started to work at Vetri Ristorante as a dishwasher. After five months, he says he advanced to pantry station. Four months later, he moved on to work in the kitchen at the former Jolly’s American Bar at 17th and Walnut, where he worked for four years. A year back in Mexico followed before returning to Philly and Vetri Ristorante in 2008. Between 2010-2012, he worked at Vetri group restaurant Amis as a sous chef. There, Benjamin Miller and Cristina Martinez of South Philly Barbacoa worked under him. Since 2012, he’s been working the line at Vetri Ristorante.